At least a foot of snow is in the forecast from Philadelphia to Maine, and if the most intense forecast comes to fruition, two feet of snow could fall on New York City as winds gust to 50 mph. 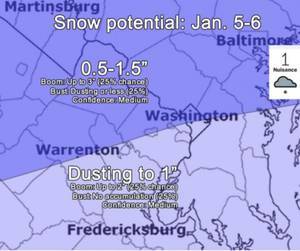 (This post, originally published at 11:50 a.m., was updated to include Capital Weather Gang's winter storm impact scale ratings at 1:30 p.m.
Are you prepping for the Northeast blizzard? Here are some suggestions. The Capital Weather Gang's Kathryn Prociv suggests quick and easy things such as peanut butter and jelly, or non-perishables, such as soup, that won't spoil. PM Update: Wind chill values in the teens tonight. Not quite as cold Sunday. 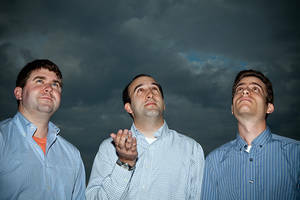 Weren't we enjoying 70-degree weather on roof decks just a few weeks ago? If you go out onto the roof deck tonight, make sure you have your gloves and winter hat. 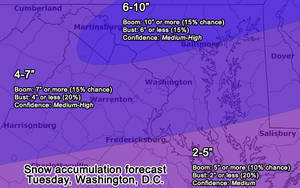 View the current weather conditions at The Washington Post. Tomorrow (Saturday): This is a classic “looks nicer from inside than it really is” type of day. Normal peak bloom (using data from 1981 to 2010) is around April 1. The earliest peak bloom on record occurred March 15, 1990. [Cherry-blossom peak bloom delayed because of cold snap, Park Service says]. A wildflower superbloom is underway in the desert Southwest in March after seven inches of winter rain. Anza-Borrego State Park in California hasn't experienced a bloom so prolific since at least 1999 according to park officials. View the current weather conditions at The Washington Post headquarters. 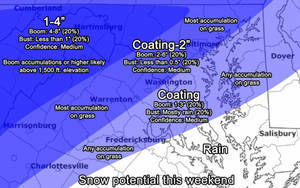 FORECAST IN DETAIL. Dress warmly in the coming days! During America's abnormally warm February, enjoying the 70-degree weather just didn't feel right, many people said. 9:15 a.m. update: The National Weather Service Storm Prediction Center has placed the D.C. area under an “enhanced risk” of severe thunderstorms this afternoon. [Capital Weather Gang Cherry Blossom coverage]. Blossom photos by Kevin Ambrose. To track the blossom bloom, every week we'll post a photo of the cherry tree (below) at the Tidal Basin as we transition from winter to spring. Springlike weather recharges for the first half of this week as temperatures warm from the 50s Monday to the 70s on Wednesday, March's first day. #Snochi: It isn't over yet. 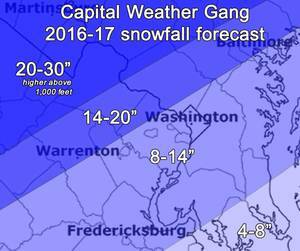 Biggest storm of the season hits D.C. 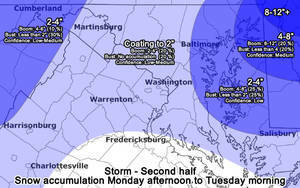 Heaviest snow moves into D.C.
Frankenstorm heading for the East Coast?